Zeolite is a molecular sponge (molecular sieve) with high porosity and absorbs free ammonia and other cat odours; not just absorbing and masking, but trapping and holding the cause of pet odor. Zeolite is the world's only naturally occurring negatively charged mineral and therefore Zeolite seeks and holds positive ions and aqueous molecules (such as salts and ammonia from cat waste). 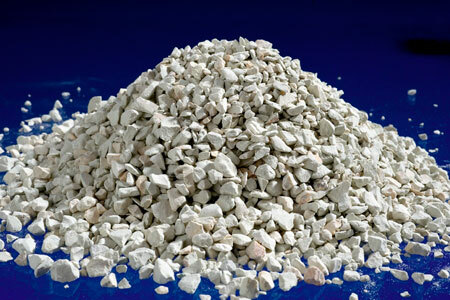 In Europe and North America Zeolite is currently used in two types of cat litter (traditional and clumping). Zeolite is safe for pets , pet owners and the environment while prohibiting the formation of odors. For any pet accidents outside of their litter area simply add Zeolite to the area to absorb moisture and odors. Zeolites have distinctive properties as absorbents as they provide a strong molecular structure and micro-porosity, making them durable under the heaviest traffic. The pores extend deep into the molecular structure of the Zeolite resulting in a high surface area within the material. The depth of these pores allow for continuous effective absorption. The benefits of high internal surface area, physical strength and the ion exchange properties of the Zeolite, account for its exceptional performance as a cat litter and odor control applications. Zeolite is becoming prominent in the market place has been as a cat litter due to its ammonia absorption and lock-up capability as well as its waste and odor absorption capabilities. Unlike clay absorbents which are made of a plate type structure, zeolites crystal lattice forms a honeycomb structure resulting in a large and reactive surface area. This traps waste molecules and odours through molecular sieving capability, allowing selective separation, absorption and immobilization. Another unique feature is that Zeolite does not swell as in the case with clay. Zeolite does not lose its structural integrity (as clay absorbs moisture the plates swell and become soft and muddy). The honeycomb structure of Zeolite absorbs at a greater rate yet stays firm and stable. When your animal walks on it, the integrity is the same as when Zeolite came out of the bag whereas clay absorbent will become soft. Zeolite cat litter consists of 100% natural Zeolite Mineral that is a molecular sponge with high porosity lock – up capability to absorb free ammonia and other cat odors. Maximum Hygiene- Cats Beachs minerals inhibit bacterial growth, providing maximum hygiene. Large Absorption - Cats Beach will enable a longer time of usage due to its large absorption capacity. Non Sticking - Cats Beach will not stick to the bottom of litter box cat's paws. Non-Mudding - Cats Beach does not liquefy by its structural properties.